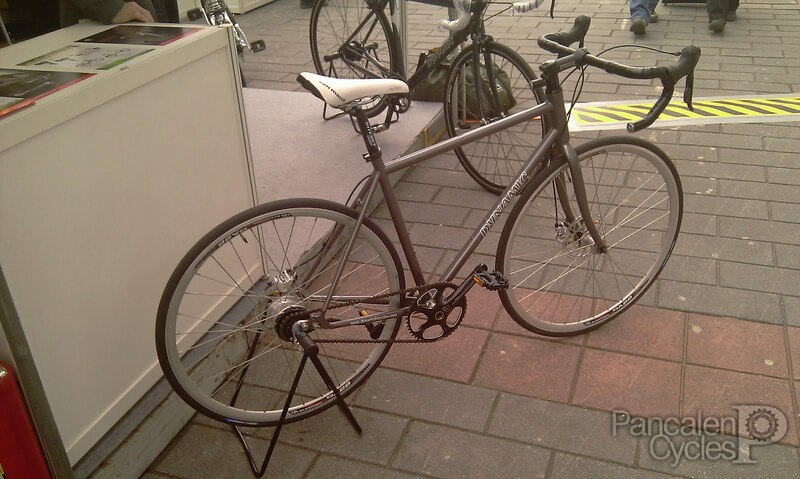 Pancalen Cycles: The 2011 Taipei Cycle Show - Day 2/3 Recap (part 3)! The 2011 Taipei Cycle Show - Day 2/3 Recap (part 3)! From my previous post, some of you will notice the rise of steel road bikes with classic, all-rounder, more relaced geometry intended for daily use. Yes, cycling is not all about sport: it's also about going from point A to B, while having fun doing it. Anyone old enough to recall the days of 10-speed bicycles (that's two chainrings and five cogs, not today's 10-speed drivetrains) will recognize Raleigh as one of the best bicycle ever. They survived through ups and downs, and it's nice to see that they retains their classic looks as well. Raleigh One Way. Full fenders, chain cover, dropbar, singlespeed, cantilever brakes... MUST. HAVE. ...though fixed lenses are good to bring out details like this. Looks like someone's having too much time with plasma cutters. But no, Raleighs are not all about classic retro look. Check out their latest offering for the 21st century, high modulus monocoque carbon framed Raleigh Team. This Pro Best Of (quite a name, isn't it? ), Cinelli's top-of-the-line carbon model, is the highlight on Cinelli distributor's booth. It's a relief not to see beefed-up oversize bottom bracket shell here. And it's even more amazing to see the details on Cinelli's steel frame lineup, on the days of multi-axially hydroformed aluminium tubes and plain aero-profiled monocoque carbon frames like these. Cinelli XCr, named after the Columbus stainless steel tubing used for the frame. Sweet polished steel finish. XCr's seat cluster is derived from the legendary Supercorsa , a frame remain in production line after 40 years. Speaking of tubings, check out what I've found on Yasujiro Tange's booth. These one-off frames are not made BY Tange, but made WITH Tange tubings, to show people what their tubings and lugs are capable of. Don't expect them to be out on production. Someone bought a frame exactly like this off Interbike 2010 and shipped it to Jakarta, where I build it a couple months ago. Also on display are lugs and frame components made by Tange, along with some other parts like stems and Tange-labeled hubs. Their hub manufacturer is just around the corner. Just across Cinelli's booth is Gios distributor's, with a mix of classic and modern road bikes featured in display, all in Gios' signature blue. Well, except for one. What, Vittoria Randonneurs instead of knobbies? BLASPHEMY. I am SOOO going to make a replica of this, soon. Masi Bicycles derived its name from Faliero Masi, who commenced making bicycle frames at the Vigorelli Velodrome in Milano in the 1950s, after a career as a professional racer and team mechanic. In 1973 his son Alberto took over the Vigorelli shop while Faliero and two assistants came to the US and began production at a new facility in California after selling the "Cicli Masi" name and trademark to an American businessman, Roland Sahm. Many well-known and successful professional cyclists rode Masi bikes, such as Antonio Maspes, Fausto Coppi, Felice Gimondi, Jacques Anquetil and Eddy Merckx. The brand Masi Bicycles is now owned by Haro Bikes, and you can expect them to be distributed in Indonesia starting this April by Rocket Company. Masi also have their own componentry lineup, Brev M.
Masi is not all about classic steel, as shown by this carbon Evoluzione. While we're on it, here's another shot on other manufacturer's attempt on steel road bikes. BH stands for Beistegui Hermanos, or Beistegui Brothers. Interestingly, Campagnolo parts looked classic on a classic frames, yet it's not out of place on modern frames. Also found on Wheeler's booth is this frame with modern technology smothered all over it, like integrated seatmast and press-fit bottom bracket bearing. And this track bike with the cockpit slammed all the way down. Talking about classic componentry, here's what's displayed on Dia Compe's booth. Apparently anodized coloured components are here to stay. Cantilever brake with threadless post and neat hardwares. When was the last time you see centerpull calipers like this installed on a bike? Sugino displayed a lot of brand new stuffs on their booth, including a double chainring crankset with outboard bearing bottom brackets. New for 2011 is their track hub, featuring splined cog mount (yes, you need Sugino special cogs for this) and new lockring design, specified to be opened or closed using Shimano's TL-FC32 outboard bearing bottom bracket tool (or something like that, like Park Tool's BBT-9). It's hard not to like their display. Look at those chainring bolts! Featured also at Sugino, their new hard anodized and polished Sugino Super 75 and another 75s in assorted anodized colours. No NJS approval for these, sorry. Yes, yes, here are those NJS approved parts, you obsessed hipsters. Also worth noting is this saddle from BPeople, where they combined 21st century strength and lightness as found on Selle San Marco Aspide Superleggera full-carbon saddle with the wit and charm of a classic leather saddle. They fused genuine leather directly to the saddle's carbon surface, producing this beauty. Built with craftmanship so nice, you can't even notice the seam between the leather and the carbon. For the more conservative weight-weenies. Oh, yes. Just like what I mentioned earlier, cycling is also about going from point A to point B, which means a mode of transportation. Hybrids and city bikes are spotted everywhere on the show, including this belt-driven flatbar hybrid Sanfa. Found outside the building is this demo bike, equipped with--get this--Versa dropbar shifter that compatible with Shimano Alfine internal geared hub! Shown here is their latest version, which is compatible with the new Alfine 11-speed hub. Shown built with disc brakes, this brifter uses cable pull travel similar to cantilever/caliper brake levers. Yes, Tektro Lyra shown here is different from any usual mechanical disc calipers: they worked only with brifters or short pull brake levers, just like Avid BB-Road series. Let's get back inside to see some racks. Steel racks, to be exact... oh yeah, and bags made from genuine leather, designed for cycling use. And to end my report, here's an integrated front rack/handlebar mounted to a minivelo. Neat! Okay, that's all. Thanks for reading my Taipei Cycle Show report posts! It was a great experience, can't wait to do it again!